Rated 5 out of 5 by KeishaJL from Not for everyone but certainly a WIN for Agatha Christie fans! I'm a huge fan of Agatha Christie games. I love the Hercule Poirot series and mysteries and was very excited when I saw this one on BFG. Having previously played 3 others, I know this is not an HOG and anyone that plays the Demo version will know that right away. I don't think that should earn it less stars. The game plays like other AC's in that you find areas and clues to solve murders as a brilliant detective. The ego points were just funny little icing on the cake. Game play isn't the easiest to get use to. If you double click in an area quickly enough he'll go a half step faster but you will sometimes want to bang your head on your desk at the slowness of his roll. Occasionally, the game glitches when you are on a character and trying to choose look vs. speak. I don't hole that against this game either. As a general rule I can speed through BFG's HOGs lightning fast. Within a few hours I'm left with nothing to do but replay or find another one to replay. I gave AC's ABC Murders 5 stars because even when I know bits and pieces of the storyline already, it took me several days of gameplay and concentration to finish. I love that! I want more of that. This game is totally worth the money if you love detective stories. Again, the controls can be annoying but well worth it in the end. Rated 5 out of 5 by CameoLove from Brilliant! I love a third person adventure game. It is fun to be able to actually see the person you are playing. I also love a good mystery, so this game is my idea of total fun! Like reading a good book and actually being in the story. The graphics may not be the best, but the fun factor more then makes up for it. Rated 5 out of 5 by uvujog10 from Wow - Terrific game What a brilliant game this is. 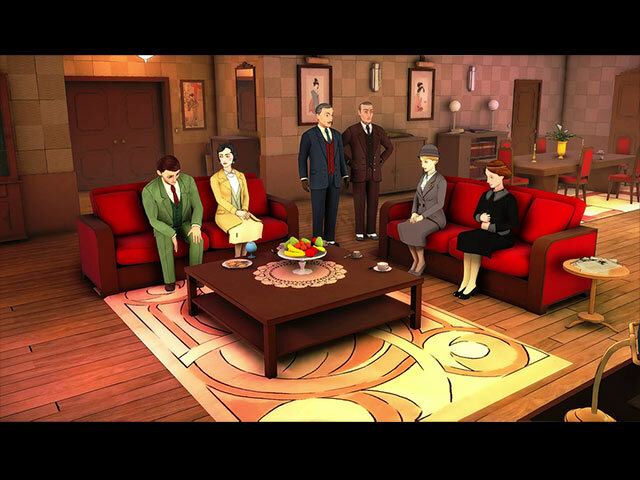 Having played other Agatha Christie PC games on disc from store purchases I found this to be excellent particularly the puzzle tasks which were almost on a par with the Nancy Drew games. There are 3 murders to be solved and various locations to visit to solve whodunit. 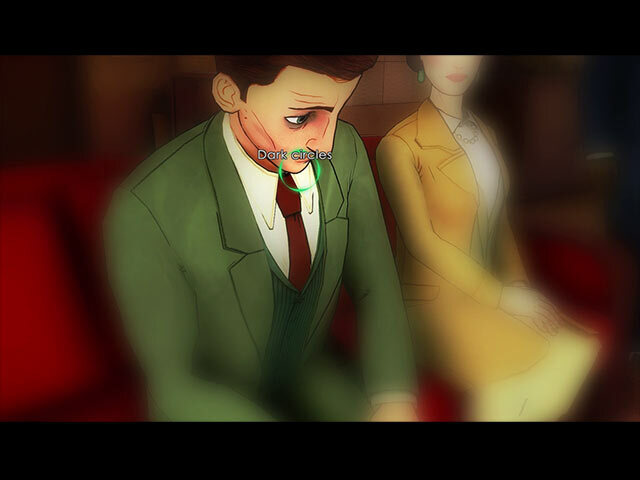 The only negative aspect are the actual characters which at first I didn't like as they were too cartoonish for me and weren't as humanlike as the characters in other Agatha Christie games I played but I got used to them and thoroughly enjoyed the game and was sorry when it came to an end. Wouldn't class it as a Hidden Object game tho more an advantage murder mystery. Rated 5 out of 5 by puzzler46 from Agatha Christie's Poirot to the rescue I purchased this one immediately as I am a big Agatha Christie fan and love the previous games. I think it followed the book very well and loved the portrayal of the characters. It is an adventure game not a HOG and has a hint system but you do need to think on this one. I am really enjoying playing it. Rated 5 out of 5 by LunaNik from Magnifique! Review based on: full demo Overall rating: ????? What my rating means: Quel bon jeu! SHORT & SWEET SUMMARY REVIEW …and now, for something completely different! This is a real murder mystery, where you examine the scenes for clues, question suspects, and put the clues together to answer pertinent questions. Along the way, you’ll encounter puzzles which you’re left completely alone to solve. It’s brilliant! More details on the specific elements of the game below the fold… ———————————————————— STORYLINE The great Hercule Poirot has received a letter from a wannabe serial killer informing him as to the date and place of the first murder. So, off we go to Andover with Hastings at our side to solve the murder of Alice Ascher, owner of a tobacco shop. Presumably, this will be followed by the murder of someone with the initials B.B. in a location beginning with B, and so on. But for now, let’s put our little grey cells to work! EXPLORATION Examine the murder scene and its surroundings for clues, which will be recorded in Poirot’s notebook. Question suspects and witnesses, which may go well or horribly awry, depending on your choices. Observe the suspects and witnesses to determine whether they’re telling the truth. Solve puzzles to gain access to cabinets, boxes, and the like. And connect the gathered clues to answer questions about the case. HIDDEN OBJECT SCENES None. This is not a Hidden Object game. PUZZLES I encountered three during the demo: • Unlock the cash register, then open the hidden cache by finding and using the code. • Unlock the box by finding and activating the hidden buttons. • Unlock the credenza by solving the maze, then correctly positioning the decorations. DESIGN Your mouse controls everything. Click in the scene where you wish Detective Poirot to move. When an area can be examined in close-up, the pointer will change to a spectacles icon. When you have a choice of actions, the pointer will change to a rounded down arrow; holding the mouse button down will show you available actions. (This occurs when you hover over a person, and the choices are usually “speak to” or “observe.”) A grasping hand means you can interact with an item. You can also click/drag items to rotate them for examination. PRODUCTION The graphics are bold comic book style, and done well. Animation is smooth, with cutscenes having an “action movie” style. Music is evocative of a murder mystery and accents the theme nicely. And the voiceovers are perfect! EXTRAS There are loads of performance achievements and some scenes you can watch over again. CONCLUSION I found this game to be unique in style and gameplay with an immersive storyline, and I recommend it! It’s rare to see a game like this that’s so different. Maintenant, excusez-moi, s’il vous plait…j’ai un mystère à résoudre. Rated 4 out of 5 by pinkkitten48 from Good, thought provoking game Really good to have a thought provoking game - nice bit of challenge meant it really kept me involved. I liked that the game allows you to make mistakes and doesn't instantly guide you to the correct answers. This also gives a good deal of variety to the game - especially to the ending (no spoilers). However, it is not so open world that you wander around aimlessly for hours not knowing what to do. If there's an urgent task that needs to be done, the game will direct you towards that before it allows you to do anything else. Couple of negative points - navigating in and out of the 'zoomed in' sections was clunky - would be nice to be able to 'back out' more quickly and efficiently. Also not sure who double checked the pronuntiation of the voice actors, some of the dialogue made me giggle it was so wrong! Other than that I would definitely recommend this game - I would have given it 4.5 stars if I could! Rated 4 out of 5 by janetsui from A new type of Game!!! I really enjoyed this game. I did not have a lot of expectation when I first tried this game. I felted that the graphic was a bit in the 90's. However, after the trial version, I really wanted to carry on with the game. I purchased it and cannot stop playing until i reached the end. The story line was interesting and you get to choose how you want to solve the mystery. The only part that I didn't like was to find the cursor/click moved a bit slow. Great game! Rated 4 out of 5 by Novella2 from Interesting and different detective game I played most of the demo and like the game. It appears there is a lot to do. You get a "use a hint" choice, but it takes quite long to recharge. Also, my mouse was acting weird and made it irritating to play. Otherwise, I would have purchased it. Tried changing mouse settings, but didn't do any good. The characters are cartoon drawn. You have to use your brain and make deductions. Give it a chance to see if your mouse acts ok. A big disappointment to me that I can't buy it. Rated 4 out of 5 by steve_san from ABC is not so simple This is really an adventure game, I'm not sure why BFG has classified it as Hidden Object (I did not encounter any HO's in the trial). It is a murder mystery where you'll question witnesses, find clues, solve puzzles and try to arrive at logical deductions. 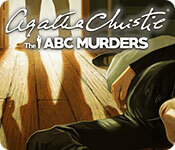 It is based on one of Dame Christie's most famous novels, The ABC Murders. It features Hercule Poirot, the Belgian detective, and his assistant Captain Hastings. The artwork and cut scenes are done in a simple style, very clear and clean. Detail is minimal but adequate. Voices are fairly well done, especially Poirot's. Regarding dialog, you are given question choices when interviewing witnesses, and the questions you choose can affect their attitude and cooperation. There is background music that is simple, pleasant and relaxing. 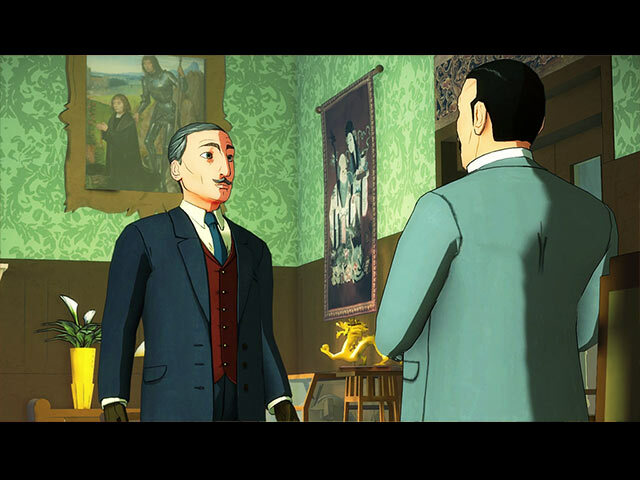 The game provides ample instructions on how to navigate, examine items, and earn extra points and trophies for acting the same way Poirot, the master detective, would act. Nevertheless, the navigation took me a little getting used to, The mouse is also used to manipulate objects for examination and to solve puzzles. This also took some getting used to. However, by the end of the trial I was comfortable with it. Each time a scene loads, there is a reminder of how to access additional game features, i.e. reconstruction of a crime. As a fan of Dame Christie I found both the game and story engaging. Prepare yourself to experience a slow pace, keep a sharp eye for clues and, most importantly, engage your "little gray cells" and I think you'll enjoy it too. Eh, bien mon ami! Rated 3 out of 5 by stephanie_press from More of this style of game but with better controls I absolutely loved the storyline and look/feel of this game. The puzzles were nice (if a bit repetitive in nature) and the characters were well-rounded and it felt like a genuine mystery unraveling. I just wish that the controls were more advance and it didn't spend so much time loading new locations/scenes. It would be nice to see more mystery stories in this style developed. Rated 3 out of 5 by Rochow from It's clunky I love Agatha Christie books and the Art Deco era particularly. Some of the visuals were wonderful. But.... The characters were distractingly bad, And having to move Poirot to each part of the room was annoying. His pronunciation of some words was not even English, let alone Belgian. The puzzles whilst quite interesting, some were almost impossible to solve without a clue. It if hadn't been half price, I doubt I would have bothered past the demo. Rated 2 out of 5 by TheDoctorIsHere from Tedious, flawed, and constantly loading the next scene I wanted to like this so badly. I really did. I'm a huge Agatha Christie fan and I've read most of her books. I also love these story telling games that *don't* have HOP scenes, especially since most HOP scenes tend to be there just to add game time. My main problem was the loading. It was painful, and during the 20-30 minutes I played, I spent about 10 minutes waiting for things to load. Even my Sims game isn't *that* bad, and it's notorious for long loading times. I don't mind challenge in clues, either, but multiple times I found myself frustrated with having to have it juuuuuuust right to trigger a clue. For example, when you examine the ABC railway guide, I had turned the book over several times before Poirot finally commented "It's open to the letter A". It took a lot of spinning the book to get him to say that. A little less sensitive, please! Finally -- and I know this is my fault -- the story didn't grip me, because I knew who the murderer was from reading the book. It was, however, an utterly faithful recreation of the book, so it did have that going for it and that's why I gave the story line such a high score. The artwork wasn't very good, distractingly bad at times, I think. Overall, I'd give this one a miss. It's not so bad that you shouldn't download the demo and try it out, but you won't get particularly far into the game during that hour because of the loading issue above. Rated 2 out of 5 by Granny_Gruff from The Book Was Better! Hercule Poirot is investigating a murder in Andover, England, one he was told to watch for in an anonymous letter. With his sidekick, Dr Hastings, Poirot is determined to ferret out the killer. Is it the drunken, estranged husband of the victim? Perhaps her demure niece? The brassy fruit seller next door? Good stuff: Lots of puzzles but no HOPs, very simple artwork, good voice characterizations, and lots of places to investigate. Bad stuff: Even when this game came out in June 2016, it was already old, with slow loading, clumsy controls, and stiff puzzles. It was helpful to be able to turn the puzzle objects 360 degrees. It was not so helpful when the game kept loading incredibly slowly. I love a good mystery, but I don't want to die of old age waiting for the next scene. And, while achievements are appreciated by some players, having them flash on the screen and stop what little action there was, is decidedly unhelpful. Bottom line: Try the Demo. You will know very quickly if this is your cup of chocolate! Rated 1 out of 5 by bobdolly from Worst Big Fish Game! Please don't waste your money or credits! The other A Christi games were fun and followed the book. This game is not what I am accustom to with Big Fish. There is nothing fun about this game, the cursor does not respond well to movement. I loaded this game on three different computers and it did not work on any of them. The only positive thing I can say is, I like Poirot's voice. It really does not deserve one Star, but I had to respond with something to leave a review. Not since the Nancy Drew game have I been so disappointed with my purchase! Hopefully I can get a refund from Big Fish...it is that bad. Rated 1 out of 5 by sandiemac from stopped the trial played the trial a total of 9 minutes...if I wanted to do all that reading and watching I would watch a foreign film with sub-titles! Rated 1 out of 5 by Winnibigoshish from ABC gets an F ABC = ABOUT as BORING as CAN be. Okay, "boring" isn't really the right word, but "frustrating" is. As some others have mentioned, it's frustrating to wait while scenes load. Also frustrating is the repeating screen "have you seen the awards you can achieve" over, and over! Yes, I've seen them, so enough already. Major frustration: if the cursor isn't exactly, and I mean exactly precisely in the perfect spot, the desired game progression will not occur. Example: in order to show that one fellow was upset and overwrought, I was trying to click that his clothes were wrinkled. After about 20 clicks on his clothes, a random click triggered "his clothes are wrinkled". Aaarrrrgh! And, as others have said, it is super clunky to get Poirot to walk anywhere. All in all, this game wasn't fun for me, and I gave up. No point if it's not fun. Rated 1 out of 5 by briarrose2445 from I've never actually just quit and deleted a game for being so boring before this... First, I'm a big fan of adventure detective games. All the past agatha christies and every single Nancy Drew game. So I'm into walking around and trying to gather clues and keep notes, etc. to try to figure out what to do next. This is not like those games. This is hardly a game. It's more like an interactive story. You are just clicking around to get to hear the next step of the story. It's sooo incredibly boring. Then they test whether you paid attention, like some egotistical person felt the story they wrote was soo good they wanted to make sure you paid attention. That's the "use your cells" steps of the game. It's not in a fun way where you paid attention so you have some hint at how to use the tools you collected. It's just straight up: choose which of these is right. And even though you have a toolbox, you hardly pick up things. This was so boring. After I failed the 2nd or 3rd "reconstruction" and it makes you listen and wait for the boring story to repeat all over again: I decided this wasn't AT ALL worth my time and deleted the game from my account. I've never - ever - done that before. This was so lame. Go back to the old style of agatha christie (ie, orient on the express, under the sun, etc. ) Nancy drew game style. This is not fun. Rated 1 out of 5 by tugboatj from Worst game ever This game is virtually unplayable. It stops, locks up, the mouse is almost uncontrollable, and the animation is almost nonexistent. Total waste of money and time (to download it). Rated 1 out of 5 by lukesmomma from Yuck! Don't waste your money!! (Wish I hadn't!) So disappointed! My fault for not testing it first. I was so excited about a new Agatha Christe game I bought it sight unseen. Terrible graphics, cutout cartoon figures, very little help. Didn't get beyond 1st part of game before I ditched it. Wish I could have given it a 'zero' score. Rated 1 out of 5 by SOS839905 from Love Poirot, Terrible Game I have been waiting for a long time for a new Agatha Christie game to come out, so when I saw that the ABC Murders was now available I jumped on it. I only did the trial first, as I always do before I get the full game to see whether I like it or not. I'm glad I operate this way. I would have been very mad if I spent any kind of money on this game. The graphics were basic cartoons at best, he game play was so slow. I lasted through getting ready to examine the first crime scene (about 5 minutes) before I quit and uninstalled the game. Very disappointed. Rated 1 out of 5 by HauntedDoll from Disappointing and slow It could have been my laptop, but this game was super slow, both in gameplay and loading of scenes. On paper this is just the type of game I like as I am a fan of the Nancy Drew style games. But the use of mouse to explore the puzzles was frustrating and impossible in the last mini game, so I had to quit. Rated 1 out of 5 by csanders1953 from Awful I enjoy these types of games but in this case movement was not smooth, tedious trying to move Poirot around. Quit demo early as Poirot kept running into things and I became very frustrated. I guess you have to read the book in order to be successful at this game.